Traditional watchmaking art "Made in Germany"
The Benu is Moritz Grossmann's first and flagship watch. This timepiece is an example of high-quality, refined watchmaking that unites the most modern technology with an elegant look. Over 240 individually hand-finished components come together to bring precision and beauty to the Benu Tourbillon. Minimalist design, advanced mechanics: The Atum's aesthetic catapults classic watchmaking into the 21st century. The Atum Pure M grants the wearer a view of the movement through its partially transparent dial. The theme of this line is straightforwardness. High-quality watchmaking is also a question of design, which the Tefnut proves in an impressive manner. Simplicity and straightforwardness define the look of this line. 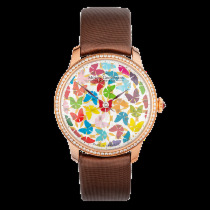 Ladies haven't been forgotten, either: Moritz Grossmann utilizes diamonds, mother-of-pearl dials, and a radial guilloché pattern in the Tefnut Lady. 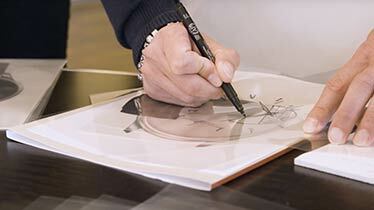 Moritz Grossmann and Chrono24 teamed up to put on an exciting design workshop for a select group of Chrono24 users. 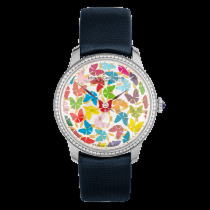 The result is this stunning watch, which will be produced in a limited run of 24 pieces. Use this once-in-a-lifetime chance to join an exclusive group of owners of this exquisite timepiece. Together with Ferdinand A. Lange, Moritz Grossmann laid the foundation for German watchmaking. He published his research, gave lectures, and founded the German School of Watchmaking in Glashütte, Germany. 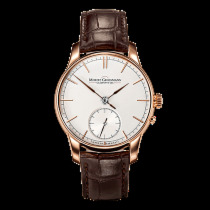 Today, as they were then, the watches from Moritz Grossmann are defined by their ingenuity. The Benu Tourbillon can be set to the exact second, as its patented stop seconds uses an elastic brush with human hair – a novelty in the world of haute horlogerie. At Moritz Grossmann, everything is handcrafted. From tiniest details to the complete movement, and from the first sketches to the completed watches. Every model embodies the combination of traditional craftsmanship and forward-reaching technology. Moritz Grossmann even produces the hands by hand. The love and attention this manufacturer gives to detail is simply outstanding and admired worldwide. The young manufacturer unites Grossmann's traditional values with the demands and possibilities of modern watchmaking. Artisinal work goes hand in hand with computer-assisted construction and finishing. The current watches from Grossmann possess characteristics of both traditional and modern watchmaking, resulting in precise works of timekeeping art. 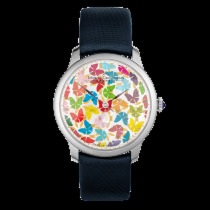 Watchmaker and internationally acclaimed businesswomen Christine Hutter revived one of the biggest names in German watchmaking when she founded Grossmann Uhren GmbH in 2008. Hutter combines traditional craftsmanship with the most modern technology in her watches. As a woman in a male-dominated field, she's making history and ushering in a new era of watchmaking.